^ MacArthur General Staff (1994). 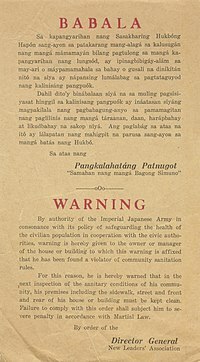 “The Japanese Offensive in the Philippines”. Report of General MacArthur: The Campaigns of MacArthur in the Pacific Volume I. GEN Harold Keith Johnson, BG Harold Nelson, Douglas MacArthur. United States Army. p. 6. LCCN 66--60005. http://www.history.army.mil/books/wwii/MacArthur%20Reports/MacArthur%20V1/ch01.htm 2013年3月24日閲覧。. ^ Astor, Gerald (2009). Crisis in the Pacific: The Battles for the Philippine Islands by the Men Who Fought Them. Random House Digital, Inc.. pp. 52–240. ISBN 978-0-307-56565-5. https://books.google.com/books?id=ZvQIQNSulLoC&lpg=PA648&ots=rVqpwYm2zV&dq=aerial%20bombardment%20of%20Philippines&pg=PA52#v=onepage&q&f=false 2013年3月24日閲覧。. ^ Morton, Louis. “The First Days of War”. In Greenfield, Kent Roberts. The Fall of the Philippines. United States Army in World War II. Orlando Ward. Washington, D.C.: United States Army. pp. 77–97. LCCN 53--63678. http://www.history.army.mil/books/wwii/5-2/5-2_5.htm 2013年3月24日閲覧。. ^ Morton, Louis (1960). “The Decision To Withdraw to Bataan”. In Greenfield, Kent Roberts. Command Decisions. Washington, D.C.: United States Army. pp. 151–172. LCCN 59--60007. http://www.history.army.mil/books/70-7_06.htm 2013年3月24日閲覧。. Kintanar, Thelma B.; Aquino, Clemen C. (2006). Kuwentong Bayan: Noong Panahon Ng Hapon : Everyday Life in a Time of War. UP Press. p. 564. ISBN 978-971-542-498-1. https://books.google.com/books?id=RdIql-o4BLQC&lpg=PA564&dq=Japan%20occupies%20manila%202%20january&pg=PA564#v=onepage&q=Japan%20occupies%20manila%202%20january&f=false 2013年3月24日閲覧。. Rottman, Gordon L. (2002). U.S. Marine Corps World War II Order of Battle: Ground and Air Units in the Pacific War, 1939–1945. Gale virtual reference library. Greenwood Publishing Group. p. 268. ISBN 978-0-313-31906-8. https://books.google.com/books?id=y56Dut69s5UC&lpg=PA268&ots=uDH9MRb7tW&dq=United%20States%20surrender%20Bataan%20Corregidor&pg=PA268#v=onepage&q=United%20States%20surrender%20Bataan%20Corregidor&f=false 2013年3月24日閲覧。. Dyess, William E. (1944). Bataan Death March: A Survivor's Account. University of Nebraska Press. p. xxi. ISBN 978-0-8032-6656-8. https://books.google.com/books?id=_sy0rUBOE8YC&lpg=PR12&ots=vohGBoFs9e&dq=Bataan%20Death%20march%20ten%20thousand&pg=PR12#v=onepage&q=Bataan%20Death%20march%20ten%20thousand&f=false 2013年3月24日閲覧。. ^ Hunt, Ray C.; Norling, Bernard (2000). Behind Japanese Lines: An American Guerilla in the Philippines. University Press of Kentucky. pp. 140–141. ISBN 978-0-8131-2755-2. https://books.google.com/books?id=Mw-x-nUmUMYC&lpg=PA145&dq=motivations%20collaboration%20Japanese%20Philippines&pg=PA140#v=onepage&q&f=false 2013年3月23日閲覧。. Rogers, Paul P. (1990). The Good Years: MacArthur and Sutherland. Greenwood Publishing Group. pp. 160–169. ISBN 978-0-275-92918-3. https://books.google.com/books?id=6momVGyl16UC&lpg=PA160&ots=KzhK8RYXFn&dq=MacArthur%20Quezon%20evacuated&pg=PA160#v=onepage&q=MacArthur%20Quezon%20evacuated&f=false 2013年3月24日閲覧。. ^ Rogers, Paul P. (1990). The Good Years: MacArthur and Sutherland. Greenwood Publishing Group. p. 184. ISBN 978-0-275-92918-3. https://books.google.com/books?id=6momVGyl16UC&lpg=PA160&ots=KzhK8RYXFn&dq=MacArthur%20Quezon%20evacuated&pg=PA184#v=onepage&q=MacArthur%20Quezon%20evacuated&f=false 2013年3月24日閲覧。. Bennett, William J. (2007). America: The Last Best Hope, Volume 1: From the Age of Discovery to a World at War, 1492–1914. Thomas Nelson Inc. p. 198. ISBN 978-1-59555-111-5. https://books.google.com/books?id=PLP5U-M8dhoC&lpg=PA198&ots=7ux06i15vE&dq=MacArthur%20ordered%20evacuated%20roosevelt&pg=PA198#v=onepage&q=MacArthur%20ordered%20evacuated%20roosevelt&f=false 2013年3月24日閲覧。. ^ Guillermo, Artemio R. (2012). Historical Dictionary of the Philippines. Historical Dictionaries of Asia, Oceania, and the Middle East Series. Scarecrow Press. p. 211. ISBN 978-0-8108-7246-2. https://books.google.com/books?id=wmgX9M_yETIC&lpg=PA211&dq=Japanese%20occupation%20Philippines%20Council%20of%20State&pg=PA211#v=onepage&q=Japanese%20occupation%20Philippines%20Council%20of%20State&f=false 2013年3月23日閲覧。. ^ Schirmer, Daniel B.; Shalom, Stephen Rosskamm, eds (1897). “War Collaboration and Resistance”. The Philippines Reader: A History of Colonialism, Neocolonialism, Dictatorship, and Resistance. International Studies. South End Press. p. 69. ISBN 978-0-89608-275-5. https://books.google.com/books?id=TXE73VWcsEEC&lpg=PA69&dq=Japanese%20collaboration%20Philippines%201941&pg=PA69#v=onepage&q=Japanese%20collaboration%20Philippines%201941&f=false 2013年3月23日閲覧。. Ooi, Keat Gin, ed (2004). Southeast Asia: A Historical Encyclopedia, from Angkor Wat to East Timor, Volume 1. ABC-CLIO. pp. 368–369. ISBN 978-1-57607-770-2. https://books.google.com/books?id=QKgraWbb7yoC&lpg=PA372&ots=3WuVFda8TY&dq=Japanese%20collaboration%20Philippines%201941&pg=PA368#v=onepage&q=Japanese%20collaboration%20Philippines%201941&f=false 2013年3月23日閲覧。. Riedinger, Jeffrey M. (1995). Agrarian Reform in the Philippines: Democratic Transitions and Redistributive Reform. Stanford University Press. p. 22. ISBN 978-0-8047-2530-9. https://books.google.com/books?id=FlasRfravpEC&lpg=PA22&ots=Cw32RsfAHX&dq=Japanese%20collaboration%20Philippines%20elites&pg=PA22#v=onepage&q=Japanese%20collaboration%20Philippines%20elites&f=false 2013年3月23日閲覧。. ^ Abinales, Patricio N.; Amoroso, Donna J. (2005). State And Society in the Philippines. State and Society in East Asia Series. Rowman & Littlefield. pp. 159–160. ISBN 978-0-7425-1024-1. https://books.google.com/books?id=xiOQdEzgP9kC&lpg=PA160&dq=Jose%20Laurel%20President%20Second%20republic%20Japan&pg=PA159#v=onepage&q&f=false 2013年3月23日閲覧。. ^ Pomeroy, William J. (1992). The Philippines: Colonialism, Collaboration, and Resistance. International Publishers Co. pp. 116–118. ISBN 978-0-7178-0692-8. https://books.google.com/books?id=vQPpEa02N5kC&lpg=PA118&dq=motivations%20collaboration%20Japanese%20Philippines&pg=PA116#v=onepage&q=motivations%20collaboration%20Japanese%20Philippines&f=false 2013年3月23日閲覧。. ^ Hunt, Ray C.; Norling, Bernard (2000). Behind Japanese Lines: An American Guerilla in the Philippines. University Press of Kentucky. p. 142. ISBN 978-0-8131-2755-2. https://books.google.com/books?id=Mw-x-nUmUMYC&lpg=PA145&dq=motivations%20collaboration%20Japanese%20Philippines&pg=PA142#v=onepage&q&f=false 2013年3月23日閲覧。. ^ Cyr, Arthur I.; Tucker, Spencer (2012). “Collaboration”. In Roberts, Priscilla. World War II: The Essential Reference Guide. ABC-CLIO. p. 52. ISBN 978-1-61069-101-7. https://books.google.com/books?id=Cz8yiLUswTkC&lpg=PA52&dq=motivations%20collaboration%20Japanese%20Philippines&pg=PA52#v=onepage&q&f=false 2013年3月23日閲覧。. Gordon L. Rottman (2002). World War 2 Pacific Island Guide. Greenwood Publishing Group. p. 318. ISBN 978-0-313-31395-0. https://books.google.com/books?id=ChyilRml0hcC&pg=PA318. "War crime trail affidavits list 131,028 Filipino civilians murdered in seventy-two large-scale massacres and remote incidents." Werner Gruhl (31 December 2011). 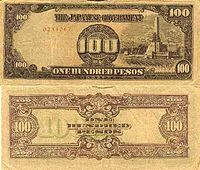 Imperial Japan's World War Two: 1931–1945. Transaction Publishers. p. 93. ISBN 978-1-4128-0926-9. https://books.google.com/books?id=zNN6M97vYMEC&pg=PA93. ^ Caraccilo, Dominic J. (2005). Surviving Bataan And Beyond: Colonel Irvin Alexander's Odyssey As A Japanese Prisoner Of War. Stackpole Books. pp. 287. ISBN 978-0-8117-3248-2. https://books.google.com/books?id=aWfqFW_OFmQC. ^ Villanueva, Rudy; Renato E. Madrid (2003). The Vicente Rama reader: an introduction for modern readers. Quezon City: Ateneo de Manila University Press. p. 140. ISBN 971-550-441-8. https://books.google.com/books?id=efazAauJT9gC&dq=Ismael+Ingeniero&source=gbs_navlinks_s 2011年1月4日閲覧。. ^ Bradsher, Greg (2005). “The "Z Plan" Story: Japan's 1944 Naval Battle Strategy Drifts into U.S. Hands, Part 2”. Prologue Magazine (The U.S. National Archives and Records Administration) 37 (3). https://www.archives.gov/publications/prologue/2005/fall/z-plan-2.html 2011年2月4日閲覧。. ^ Dolan, Ronald E. “World War II, 1941–45”. Philippines : a country study (4th ed.). Federal Research Division, Library of Congress. ISBN 0-8444-0748-8. http://memory.loc.gov/cgi-bin/query/r?frd/cstdy:@field(DOCID+ph0033). ^ Schaefer, Chris (2004). Bataan Diary. Riverview Publishing. p. 434. ISBN 0-9761084-0-2. ^ Valeriano, Napoleon D.; Charles T. R. Bohannan (2006). Counter-guerrilla operations: the Philippine experience. Westport, Connecticut: Greenwood Publishing Group. p. 103. ISBN 978-0-275-99265-1. https://books.google.com/books?id=zgrEos2CGoEC&lpg=PA103&dq=Guerilla%20Philippine%20liberation%20fighting&pg=PA103#v=onepage&q&f=false 2011年5月7日閲覧。. ^ Norling, Bernard (2005). The Intrepid Guerrillas of North Luzon. University Press of Kentucky. p. 284. ISBN 9780813191348. https://books.google.com/books?id=xL-JoQYiwykC 2009年5月21日閲覧。. ^ My Father by Jose Calugas Jr.
^ Hogan, David W., Jr. (1992). U.S. Army Special Operations in World War II. Washington, D.C.: Department of the Army. p. 81. http://www.history.army.mil/books/wwii/70-42/70-424.html 2011年1月25日閲覧。. ^ Roscoe, Theodore; Richard G. Voge, United States Bureau of Naval Personnel (1949). United States submarine operations in World War II. Naval Institute Press. p. 577. ISBN 0-87021-731-3. https://books.google.com/books?id=5lTI_dF4jocC&dq=evacuated+injured+submarines+world+war+II+philippines&source=gbs_navlinks_s 2011年1月25日閲覧。. ^ a b Rottman, Gordon L. (2005). US Special Warfare Units in the Pacific Theater 1941–45. Osprey Publishing. pp. 44–45. ISBN 978-1-84176-707-9. https://books.google.com/books?id=sMnCNdLO888C&lpg=PA41&ots=7OPS3qfLis&dq=5217th%20Reconnaissance%20Battalion&pg=PA45#v=onepage&q=Alamo%20Scouts&f=false 2009年12月3日閲覧。. ^ Holian, Thomas (2004). “Saviors and Suppliers: World War II Submarine Special Operations in the Philippines”. Undersea Warfare (United States Navy) Summer (23). オリジナルの29 June 2011時点によるアーカイブ。. https://web.archive.org/web/20110629063534/http://www.navy.mil/navydata/cno/n87/usw/issue_23/saviors.htm 2011年1月25日閲覧。. ^ Rottman, Godron L. (2002). World War 2 Pacific island guide. Westport, Connecticut: Greenwood Publishing Group. p. 318. ISBN 978-0-313-31395-0. https://books.google.com/books?id=ChyilRml0hcC&lpg=PA318&dq=guerrilla%20Philippine%20liberation%20fighting%20Japanese&pg=PA318#v=onepage&q&f=false 2011年5月7日閲覧。. ^ Chambers, John Whiteclay; Fred Anderson (1999). The Oxford companion to American military history. New York City: Oxford University Press US. p. 547. ISBN 978-0-19-507198-6. https://books.google.com/books?id=_Rzy_yNMKbcC&lpg=PA547&dq=guerrilla%20Philippine%20liberation%20fighting%20Japanese&pg=PA547#v=onepage&q&f=false 2011年5月7日閲覧。. ^ Rottman, Gordon L. (2002). World War 2 Pacific island guide. Greenwood Publishing Group. p. 318. ISBN 978-0-313-31395-0. https://books.google.com/books?id=ChyilRml0hcC&lpg=PA318&dq=Killed%20philippines%20world%20war%20II&pg=PA318#v=onepage&q&f=false 2012年1月9日閲覧。. Ephraim, Frank (2003). Escape to Manila: From Nazi Tyranny to Japanese Terror. University of Illinois Press. p. 220. ISBN 978-0-252-02845-8. https://books.google.com/books?id=Jdo9V9Y1ofcC&dq=Japan+occupies+manila&source=gbs_navlinks_s.